Making History is the central play in this year’s festival with rehearsed readings in Derry’s Guildhall and at An Grianán Theatre in Letterkenny. Friel’s fascination with history has inspired us to acknowledge his deep love of Homer’s two epics poems, which are part of the foundation of Western culture. And so, in lieu of the Mediterranean, we are presenting performance recitations of The Odyssey on five Donegal beaches of the Wild Atlantic Way, and in Derry you can experience the Iliad on venues on or around the Walls. Acclaimed Irish actor/director, Adrian Dunbar, will direct a special site-specific adaptation of Homer’s Odyssey, presented episodically with food and music on five of the most beautiful beaches in Donegal – an event concept designed by Doran Browne - launching ARTS OVER BORDERS, a new cross-border arts initiative for Ireland to run over the Bank Holiday weekend 24-28 August 2017. Arts Over Borders builds on the work developed over the last five years by Seán Doran and Liam Browne (Doran Browne), on the creation of the Beckett Festival & A Wilde Weekend in Enniskillen, the Brian Friel Festival in Derry & Donegal and more recently their quality year-long programme for the Opening Year of the Seamus Heaney HomePlace in Bellaghy. All these events aim to highlight the relationship between artists and the island of Ireland, crossing borders and histories. The initiative is supported by a set of Irish Artist Patrons including Colm Toibin, Fiona Shaw, Eimear McBride, Kevin Barry, Ciaran Carson, John Banville, Lisa Dwan, Lisa McInerney, Nick Laird, Roy Foster and Adrian Dunbar. 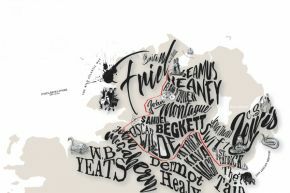 In this first year, Arts Over Borders will celebrate the relationship between Brian Friel and Homer; it is said that each year Friel would read one or other of the two Homer epics. The Odyssey will be recited by actor Niall Cusack and take place on the beaches of Tullan Strand Bundoran (24 August) with Yeats’ Ben Benbulben to one side and the highest cliffs in Europe Slieve League on the other; Narin (25 August), Carrickfin (26 August), Marble Hill (27 August) and Fahan, Inishowen (28 August) whilst in Derry’s Guildhall Square will stand Odysseus’s cunning idea of The Trojan Horse under the Walls of Derry evoking both the Troy and Derry sieges, another concept design by DoranBrowne. Over 10 days, sports of fencing, martial arts and archery will take place in the vicinity along with storytelling for children from under the belly of the horse. Frielfest 2017 will also have performed readings of three great plays by Friel in unique locations across the region: the festival’s signature play, Making History, directed by former Royal National Theatre Associate Mick Gordon (An Grianan Theatre Letterkenny & The Guildhall Derry, 25 & 26 August), The Enemy Within with 10 actors from Kabosh (St. Mary’s Church Knockmoyle where Friel was born, and St Columba’s Church, Long Tower Derry, 25 and 26 August) and a promenade Faith Healer in community halls in Glenties, Portnoo and Ardara ending up at the Highlands Hotel in Glenties, the location of Brian Friel’s grave (August 25-27). Christopher Logue’s unfinished epic War Music, an account of Homer’s Iliad written over 30 years, will be directed by Conall Morrison (hot on the heels of his recent 5-star Guardian review for his Galway International Arts Festival hit Woyzeck in Winter) in five indoor locations along the magnificent Walls of Derry and involving three actors (24-28 August). Prior to the reading of Making History in the Guildhall, Dr. Malachy O’Neill, Provost of the Ulster University Magee campus, will give an introductory talk on the place of the play in Friel’s work and earlier that afternoon Malachi O’Doherty and Brian Feeney debate how history is made and the role of traditional and social media in this.